All of us, at some point in our social media time-wasting routine, have come across cute videos of cats and dogs. The videos are mostly of the pets showing human like behaviour, or just being plain adorable and funny. Needless to say, dogs are one of the most loving of all pets, among pets who are normally more affectionate towards humans than fellow humans themselves. And dogs do really well when they are left to play with children. Having a pet puppy to grow up with is an amazing experience, and people who do so end up with high standards for love and relationships. Dogs, like all pets, love their humans unconditionally. This is also showcased in a number of videos all over social media. Recently, a certain video however broke all boundaries. To be honest, it was the special little dog in the video who broke all boundaries. She is Penelope, an especially loving pup. Dogs love all babies, but Penelope, in her video is seen loving and acting affectionate even to her unborn human sibling. The level of empathy and love dogs can show towards other humans is unparalleled and even at that, Penelope’s empathy towards her pregnant human Juliana’s womb is something special. It appears that whatever is happening inside Juliana hasn’t escaped her furry little friend. 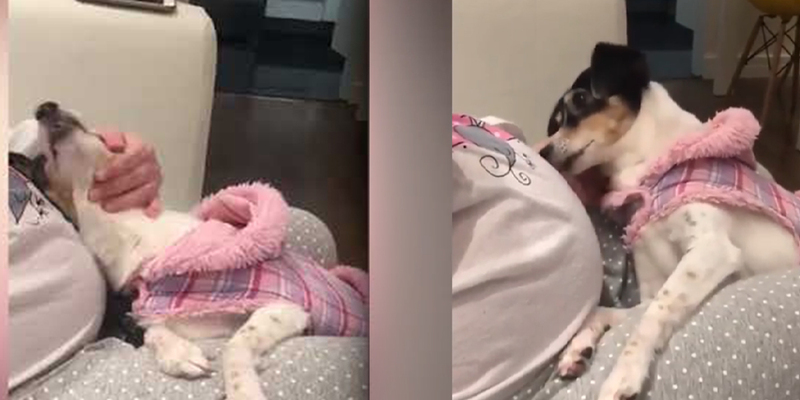 And while the antics of dogs make us laugh, Penelope cuddling up to her mom’s tummy to nuzzle and cuddle with her unborn little sibling is quite the pleasant sight to behold. It has got millions going “aww” already. These are the kind of things that should make people realise something even deeper than dogs just being loving and caring. This proves just how perceptive, intelligent and emotional our canine friends can be. There is no hate in her despite (probably) realising that there is going to be competition for Juliana’s affections in the future. Rather, she seems to be fitting into her new role as the elder sibling quite well. You would expect such loving behaviour from an elder sister, and really if you think hard on it, it is not surprising to have a pooch exhibiting tendencies. Dogs have very short lives. In case you don’t know, fourteen days pass for a dog every time a day passes for their humans. In that short time, they know that they just have you and no one else to care about, love or play with. All they ask for is you to stay with them, love them, feed them and play with them: everything you would do to your own child. Hence, think twice if you are planning on getting a dog because they sure will love you with all their heart. If you cannot return it to them, it would be a sin against God. And there’s no forgiveness for cruelty against an innocent, mute animal who cannot express itself in terms understandable by humans. Even at that, pooches like Penelope show love in such touching ways. In more ways than one, these lovely animals inspire us to be more human than we already are. Make every single day of their lives special, just like they do for you.
? Why Wolves Are Beautiful Animals This 69 Year Old Proves That Age Is Just A Number ?